Review: When three ordinary girls discover a series of clues that may be leading to the Ring of Rocamadour, they fall into many problems. Some are easy, some are not so easy. Can they get to the ring before someone else does? Or will the ring fall into the wrong hands and be lost forever? These questions will all be answered in the book The Red Blazer Girls: The Ring of Rocamadour by Michael D. Beils. When 11 year old Sophie, the main character, and her friends Rebbeca Chen and Margret Wrobel (both age 11) make an unlikely friend, elderly Elizabeth Harriman, Elizabeth Harriman tells them that she has found a script written by her father to his granddaughter. The script basically says that the Ring of Rocamadour, a ring that makes your dreams come true, is hidden inside of St. Veronica, the girls’ school. Elizabeth Harriman wants them to find it so she can give it to her daughter as an apology present for not seeing her for many years. When trying to find the ring, they team up with Rafael Arocho, Sophie’s friend to find the ring. They run into many problems such as Elizabeth’s ex-husband who also seems to want the ring. Will they get it before Elizabeth Harriman’s ex-husband does? This book is extremely entertaining. It kept me thinking and involved the reader to try to solve the problems. For example, right before the problem is answered, the book says “Before you turn the page, try to solve the problem. You’ll feel super smart!” This book is appropriate for all ages. It’s not violent and is funny and entertaining. 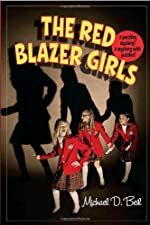 In my opinion, the writer did an excellent job, and I am eager to read The Red Blazer Girls: The Ring of Rocamadour again. The book is funny at times, but also very sad. The book kept me on my feet and wondering what would happen next. It took many unexpected turns that surprised me. My favorite character is Rebbeca. She is a good artist and is very thoughtful. She gave up a night with Sophie and Margret to let her mom go out with a friend to go see the movies. Overall if I could rate this book on a scale of 1 to 5, I would give it a 4½. This is a fairly good book even though it is a little slow in the beginning of the book. Review written by Sarah, Grade 6. Date of review: October 2009.